After he moved toBangladesh with his wife and infant son, Henry Richards of Belmont, Massachusetts, had some free time on his hands. He began perusing WoodenBoat in hopes of finding a boat that was fast and on the easier side to build. 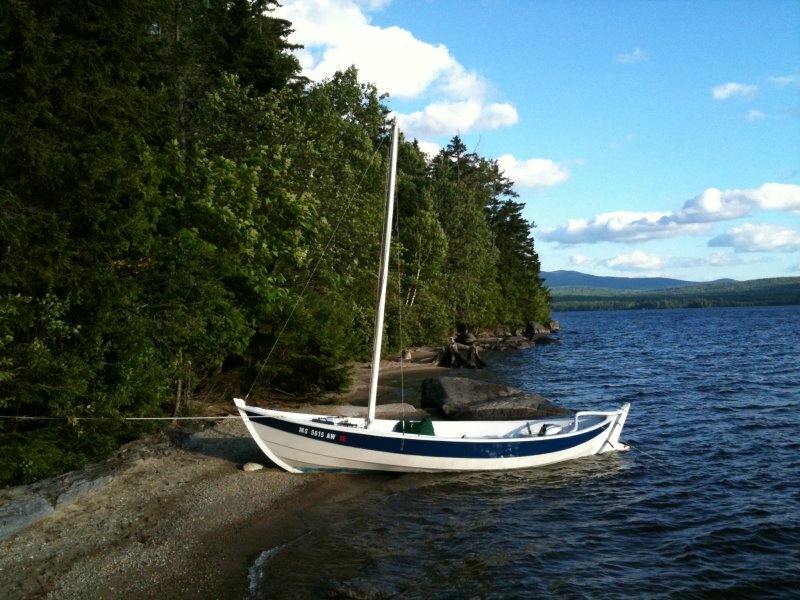 One day, he came upon a photo of Iain Oughtred’s Caledonia Yawl that took my breath away. Exploring further, he also found the CY had a large fan base, notably on the Crazy Bird CY discussion page. He'd never built a boat before and had modest woodworking experience but he ordered a set of plans from the WoodenBoat Store anyway. 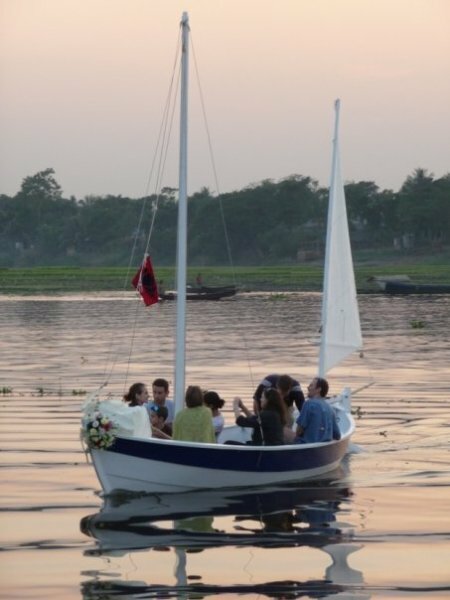 After he got to Dhaka, Henry found a friend who offered his empty carport for the boat's construction space. Then Henry had to figure out where to get some lumber. 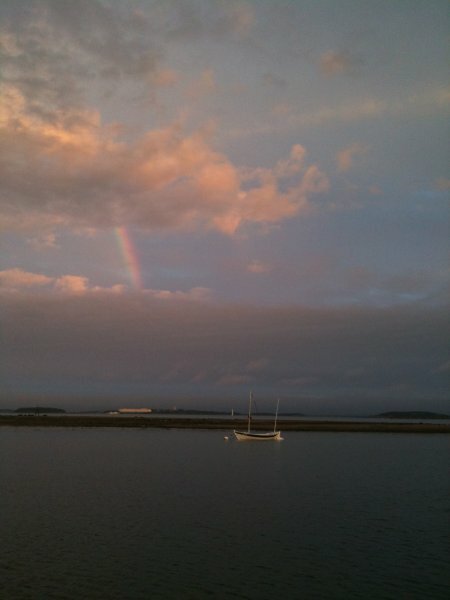 He writes, “I quickly realized that there were a number of things I had not anticipated when I dreamed about building a boat back in Boston before our move. First off, you couldn’t just drive to your local lumberyard or big box stores. On the other hand, fabulous wood seemed to be everywhere. There were large sawyer yards and huge tree trunks in lengths not found in the U.S. This of course raised questions about the source of all this wood. In the end, I avoided using these yards partly out of concern for the source of the wood and also due to the fact that no one there spoke English and local wood names don’t transfer anyway. I talked with a local furniture maker and arranged for him to provide the wood I needed. This was more expensive but easier. Without him, I would have been lost in a confusing whirlwind of unknown woods.” Marine plywood, hardware, and epoxy were also challenging for him to obtain. 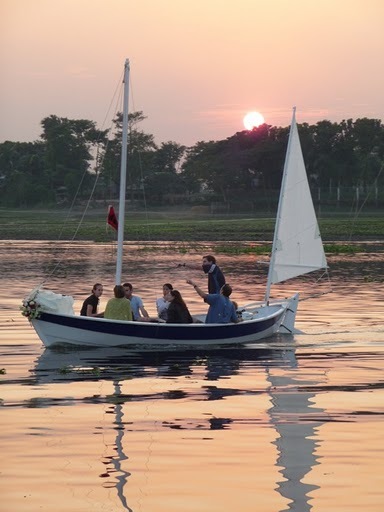 With the help of his own business travel, friends traveling to and from Europe, and another couple moving to Dhaka from the USA, Henry eventually had just about everything he needed. 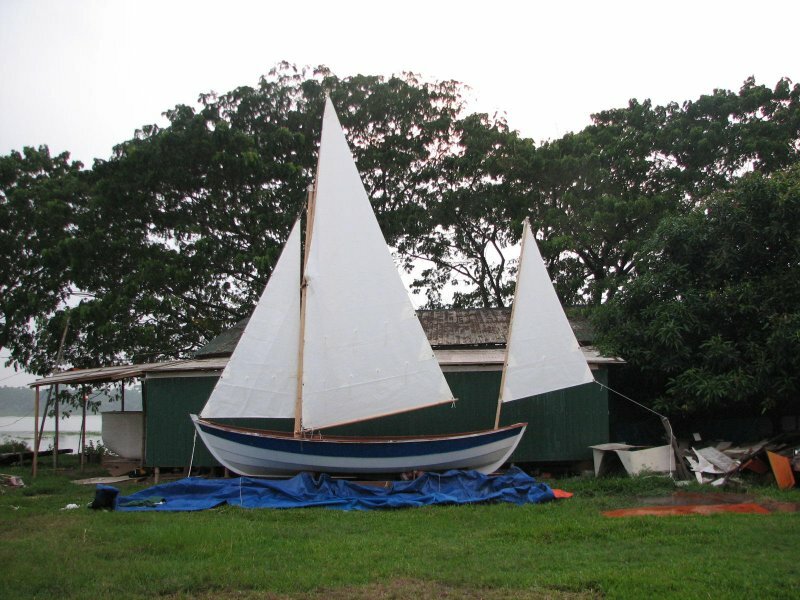 Just about the time he had the hull complete and was ready to turn it over, Henry’s carport friend moved to Australia, and Henry had to find another home for the boat. After a lot of searching, he found another carport not too far away. Now Henry just needed to find a truck to transport the boat over there. When he mentioned the problem to his wood-supplier. The man offered to help. That evening he showed up with 25 guys and a decripit-looking two-wheeled bamboo cart. They picked up the boat and strongback, carefully placed them on the cart, and began jogging down the street, holding the boat and singing all the way. With the boat safely placed in her new home, Henry continued work, and after two years of building, was finally able to launch SIRI in early 2010. A group of men carred the boat to the water, and set her afloat. After a moment or two for Henry to enjoy his accomplishment, they jumped aboard expecting a ride. Henry later moved back to the United States, and shipped SIRI home too. Henry and SIRI now can been seen sailing around Boston, Massachusetts.